The Seattle area had just gone through 61 days with no signific﻿ant precipitation. Upon my arrival on 10/11 however, the weather was changing and the 2 week forecast looked pretty wet. I decided that the rain wasn't going to slow me down on my vacation. Leesa was working in Bellevue, outside of Seattle. I decided to head east on I-90 towards Snoqualmie Pass. Washington has lots of great hiking everywhere, so I just had to pick a hike and get outdoors. My choice on this Saturday was Granite Mountain. 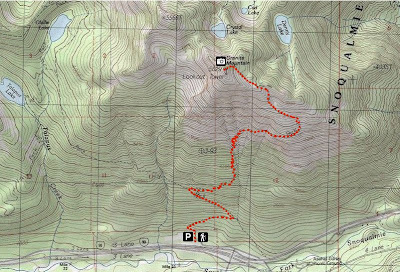 The trailhead is located just off Exit 47, slightly west of Snoqualmie Pass and about an hour and 15 minutes east of Bellevue. 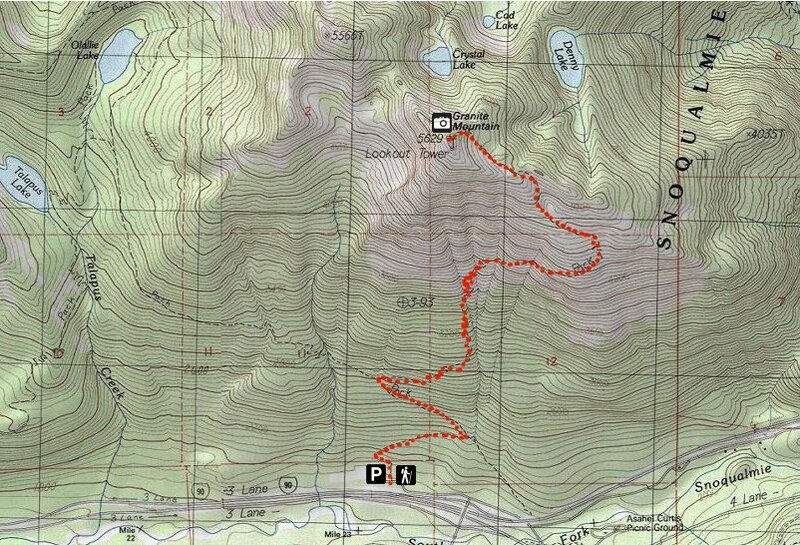 My decision to hike Granite was based on the hike description from the Washington Trails Association Hiking Guide. A high plateau on Granite. The forecast called for scattered rain and temperatures in low 50's in the valley. I got together my day pack and wet weather gear and headed out. The hike was an 8 mile round trip hike. At the top of Granite Mountain is an old fire lookout. I didn't expect it to be open, but I thought it would be nice to check out. One thing I always notice about hiking in the west, is how much easier the hiking is, due to the smooth trails. They are generally fine gravel and sand as opposed to the mud, rocks and roots in the Adirondacks of NY where I generally hike. My favorite spot was a rocky alpine meadow just before the rock scramble to the summit. It looked really neat in the foggy, rainy mist of the day. After completing the scramble, the fire lookout became visible at the summit. To my good fortune, the cab was open. A Forest Service volunteer was there to stay overnight and close the building up for the winter. When I stepped in, the building was full of people. There was a japanese group of eight who looked like they were hiking to Mount Everest. They had all kinds of winter gear with them. They were cooking up a storm for lunch. There were three other groups there also. Fortunately, they were all ready to head back down, so I got to spend some time talking to the FS volunteer. I ended up carrying some paint back down to the bottom that he needed to get out of the building. The fall colors were near peak up high on the mountain. The leaves of the Huckleberry bushes were brightly colored as were all the other bushes. It would have been really bright on a sunny day. In any case, it was neat to be up in the mountains and see the clouds blow in and out. The rain never got too bad during the day, so I was only partially wet at the end of the hike. Granite is a great mountain to hike, even if visbility is limited. A good first choice to start my vacation.